Eric Knight demonstrates his device. Eric Knight is an inventor by trade, and a serial entrepreneur. An engineer and UConn alum, he lists inventions in e-commerce and rocket science among his achievements with his company, Remarkable Technologies. While mulling the problem back in 2010, Knight came across research from a team at the University of South Florida published in the Journal of Alzheimer’s Disease. It showed that treatment with an electromagnetic field seemed to reverse cognitive impairment in mice that had been specially bred to have Alzheimer’s Disease. “Inside the cage were the mice, and a radio transmitter, and twice a day for one hour per day they had this radio transmitter on. And they did that every day for the course of seven months,” Knight said. The mice that had this treatment began to show signs that their brain function was improving, like finding their way more easily through a test maze. When they were dissected, the beta-amyloid plaques in their brains that are a hallmark of Alzheimer’s disease were found to have been inhibited or even reversed. 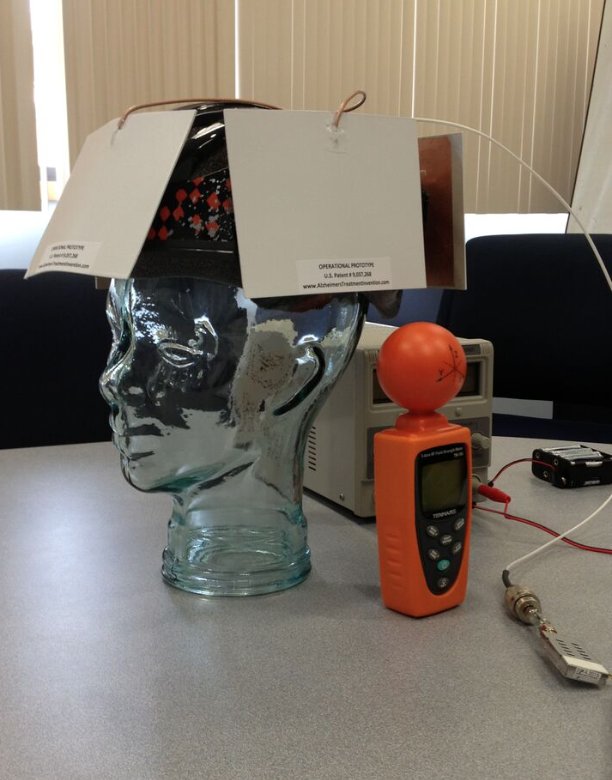 The prototype of Eric Knight's device to deliver radio waves to Alzheimers' patients. Though he has no medical background, Knight does have expertise in radio communications and avionics, having worked on a team that sent the first privately-funded rocket into space. “Kind of the ‘a ha moment’ was when I was thinking back on the antennas that we had used on our rocket, instead of them broadcasting outward from the rocket, to flip them around and have these thin antennas be able to broadcast inward to a patient’s brain,” Knight said. That’s what led to Knight's invention. It’s a device worn on a patient’s head that can give a controlled radio frequency dose to the brain, without interfering with any other electronics in the room where it’s being used. Just last week, Knight got the U.S. patent office’s seal of approval. “I was very surprised to hear about his patent, but I applaud him for the marvelous job that he did in putting the patent together,” said Dr. Gary Arendash, the lead author of the original study in mice. He too has been working to commercialize his research, and has founded a company called Neuro EM Therapeutics, based in Phoenix, Arizona. After WNPR approached Arendash about Knight’s invention, the two got in contact for the first time. “I think he has a remarkable perspective and can certainly add to what we’ve already done out here as far as designing antennas and improving on the actual device that is eventually used,” said Arendash. Now a collaboration may be in the offing, which could potentially lead to human clinical trials. Arendash said he has patients willing to participate, and the trial is already designed. But he still has to secure funding for what could be a pricey undertaking. Millions are being poured into Alzheimer’s research all over the world, but much of the cash is for new pharmaceutical treatments. And there’s no guarantee this alternative track will be a winner. Kuchel sounded a note of caution. He said that patients who have developed symptoms of Alzheimer's, and been diagnosed, are already far advanced in the disease — there’s as yet no way to pick up the very early stages of Alzheimer's. What works in mice in past studies, he said, has very often failed in human trials, perhaps because the mice are comparatively young, while in humans the aging process complicates the disease. "Animal models of Alzheimers have been on the one hand incredibly useful to understand certain mechanistic aspects of these diseases," Kuchel said. "The problem is, first of all, at the simplest level, mice are not people, particularly at the level of the brain."